Dr. Bodensteiner is concerned about the dental hygiene habits of Visalia residents. Why? 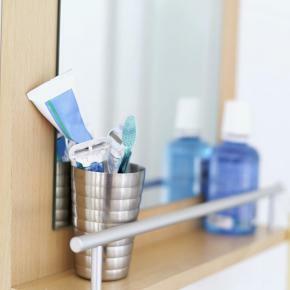 All too often, there’s a tipping of the Listerine bottle instead of the grabbing of a toothbrush. What can and can’t mouthwash do for you? Perhaps you thought swishing for 30 seconds with a tingling mouthwash was tantamount to brushing and flossing? The FDA (Food and Drug Administration) warned three companies in September of 2010 alone to cease crediting their mouth rinses with preventing gum disease. These well-known manufacturers claimed their mouth rinses could remove plaque above the gum line and keep gums healthy, since sodium fluoride was listed as the active ingredient. However, sodium fluoride is unproven in removing plaque or preventing gum disease. Can mouthwashes promote oral health? Rinses are effective in disguising bad breath and giving the mouth a fresh feel for up to three hours because of certain active ingredients. Most over-the-counter mouth rinses include ammonium compounds, boric and benzoic acids, and phenolic compounds. The “fresh” sensation comes usually from astringents added, like alum, zinc citrate, and citric acids. Alcohol is used as a solvent and taste enhancer. Important to remember is that a mouthwash doesn’t equal or match in any way the function of a toothbrush and floss. So don’t allow a “fresh mouth” merely to mask growing oral health issues. Make your appointment for a check-up and cleaning with Dr. Bodensteiner today. By promoting an education of proper dental hygiene habits in Visalia, you’ll enjoy a happy and healthier community!